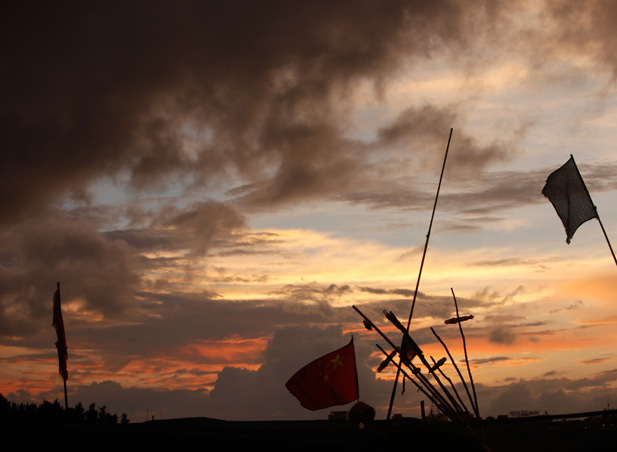 A Chinese national flag is seen on a boat at a fishing village in Tanmen town, Hainan province, next to the South China Sea (Aly Song/Courtesy Reuters). This week’s latest South China Sea incident, in which a Chinese fishing boat cut a Vietnamese seismic cable —at least according to Hanoi— is a reminder that, despite the South China Sea dominating nearly every meeting in Southeast Asia this year, the situation in the Sea appears to be getting worse. This is in contrast to flare-ups in the past, when after a period of tension, as in the mid-1990s, there was usually a cooling-off period. Although there have been several brief cooling-off periods in the past two years, including some initiated by senior Chinese leaders traveling to Southeast Asia, they have not stuck, and the situation continues to deteriorate and get more dangerous. The new Association of Southeast Asian Nations (ASEAN) secretary-general comes from Vietnam. Over the past three years, a more openly forceful China has found it difficult to deal with ASEAN leaders who even voice ASEAN concerns. But these leaders, like former Thai foreign minister and ASEAN Secretary-General Surin Pitsuwan, were nothing compared to the new ASEAN secretary-general, Vietnamese Deputy Foreign Minister Le Luong Minh. Although he is a career diplomat and certainly can be suave and attentive, he is still a former Vietnamese official, and undoubtedly will bring with him some of the Vietnamese perspective toward China, which is quickly turning more acrid. This year’s ASEAN chair is Brunei. Keeping to its tradition of rotating the chair every year, in 2013 ASEAN will be headed by Brunei. Although some might think Brunei’s leadership will be better for stability than the 2012 ASEAN leadership of Cambodia, perceived by many other ASEAN members as carrying China’s water, the fact that Brunei is just as much of a diplomatic minnow as Cambodia will mean there is no powerful wrangler in the chair’s seat to hammer out a common ASEAN perspective. Were Indonesia or Singapore the chair, the situation might be different. India is playing a larger and larger role in the South China Sea, adding even more potential players to the mix, and more powerful navies. The recent warning by Beijing that India and Vietnam should not engage in joint exploration is only going to lead to a harsher Indian response, since Indian elites pay far more attention to —and are more easily aggrieved by— China than the reverse. The more they look, the more likely they will find. As reported by the New York Times, “On Monday, China’s National Energy Administration named the South China Sea as the main offshore site for natural gas production. Within two years, China aims to produce 150 billion cubic meters of natural gas from fields in the sea, a significant increase from the 20 billion cubic meters produced so far, the agency said.” Although I do not think that the oil and gas potential in the Sea is the biggest driver of conflict, compared to its strategic value, the more China (and anyone else) explores for energy in the Sea, the more likely they will (eventually) come up with potential deposits that will only raise the stakes, if the forecasts of the Sea’s petroleum potential are to be believed. A new Chinese leadership is unlikely to want to show any weakness. With the leadership of this generation even more split than in the past, following a contentious Party Congress, continued infighting among acolytes of the major Chinese leaders, and the Bo Xilai fiasco, the new leadership is in no position, with Party members and the general educated public, to give any room on a contentious issue like the South China Sea. The Obama administration has passed its period of focusing on more effective dialogue and crisis mediation with China. Officials from the administration’s first term, who naturally had the highest hopes for better dialogue, are gone, with many of them leaving just as convinced as their Bush predecessors that real dialogue was difficult if not impossible. Don’t expect a second term to yield better results with such a dialogue.